For the past few years, I've selected a theme to guide my year. It's been a word or an idea that I can turn to in times of doubt or confusion, a mantra that will move me forward or bind me to the moment, something to help me decide what to do. I write it out, put it in a frame near my desk as a reminder. For 2012, my theme is engage. 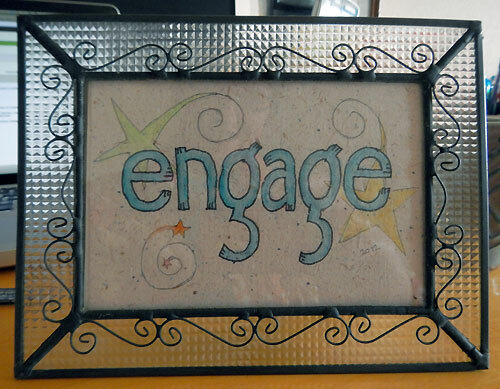 Engage means to participate, to commit, to engross, to involve. Engage suits things I do on my own and together with others. It is a theme with room for interpretation and always an impulse to act. Engage is something I can do or something I can be: I can engage in new ventures; I can engage students in learning; I can engage an audience; I can engage my fears; I can be engaged by a book; I can be engaged in a project; I can become engaged in a relationship. Some meanings that might apply in the coming year: appoint, enlist, employ, recruit, contract, bind, agree, promise, pledge, grapple, attack, attract, immerse, absorb, enthrall, captivate, fascinate, busy, enroll, fulfill, interconnect, partake.